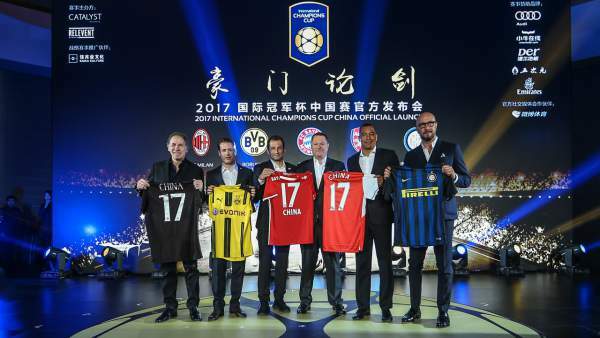 International Champions Cup 2018 schedule with full fixtures already have been announced. It features a plethora of exciting faceoffs. For instance, it will be a Manchester United vs Manchester City, a kind of Manchester Derby as well as a Real Madrid vs Barcelona, an El Clasico in the USA, etc. as a part of the 2018 ICC tournament. Apart from the above four teams, there are giants like Paris SG, Juventus, Roma, and Tottenham Hotspur taking part in the competition. The International Champions Cup live telecast will be done on the ESPN networks in the US. And that’s not all, as per the announcement made by the ICC, we will witness a Clasico between Barcelona and Real Madrid in Miami, too. Let’s hope for the best. Man United will play with both of its spanish rivals – Cristiano Ronaldo’s RMA in Santa Clara on July 23, 2017. Earlier, they had a faceoff in 2014 in Michigan. MUFC won that time in front of 109,000 football fans with 3-1. After that, the team of Jose Mourinho will play Lionel Messi’s Barcelona on July 26, 2017, at FedEx Field. Both the teams will meet for the first time after United’s victory in the 2015 ICC. Check: International Champions Cup 2018 Live Streaming. Man United will Man City in the first game on July 20 at an unspecified venue. Earlier, a friendly match was planned between the two Premier League rivals last summer in China, but it couldn’t take place due to some reasons. Going further, Man City has a game scheduled with Real Madrid in Los Angeles on July 26. Then, the City will face Tottenham on July 29 in Nashville. In another game, it will be the Juventus vs Barcelona quarterfinal rematch on July 22 in New Jersey. The tournament will see the concluding match in the USA with the Seria A rivals Juventus and AS Roma on July 30 in Massachusetts. In the pre-schedule for the ICC 2018, MNU has games with two MLS teams – LA Galaxy and Real Salt Lake at their respective hometowns. There are friendlies with Manchester United and Barcelona on August 1 and 5, 2018, respectively. ESPN will air both the matches. It will happen in Europe, but the opponents aren’t decided yet. There will also be ICC games in China and Singapore. All of them will air on ESPN networks. Come back for International Champions Cup 2018 live stream, scores, commentary, match results, and highlights. Stay tuned to TheReporterTimes for latest football news and sports updates around the world. Previous articleThe Legend of Korra Season 5: When Will The Graphic Novel & Anime Series Happen?